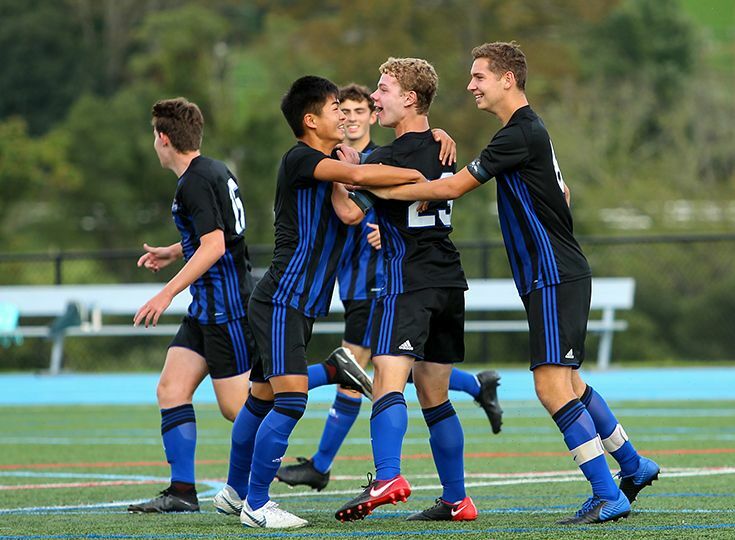 After a tough start to the season, the boys' soccer team is beginning to find its rhythm as the Knights are coming off another impressive week. Gill started off the week with a 3-2 victory over Montgomery on October 8. Andrew Moglianesi '18 led the way with 2 goals and Micaah Garnette '21 also contributed a goal. Goalie Alex Borto '22 recorded eight saves in the win. The Knights continued their strong play as they topped Blair Academy 8-2 on October 10. Leading the offensive outburst was Tyler Merna '18 as he recorded a hat trick. Moglianesi scored twice again and Jordan Canica '21 also recorded two goals. The biggest match of the week came on October 13 as Gill took on Hillsborough in the quarterfinals of the Somerset County Championship. Hillsborough, ranked 11th in the state, was the second seed in the tournament while Gill was the seventh seed. It was a hard-fought match but the Knights came up just a bit short as they lost 3-2. Scoring for Gill were Garnette and David Frankel '22. Gill currently owns a record of 7-7-1 and are tied for second place in the Raritan Division standings.